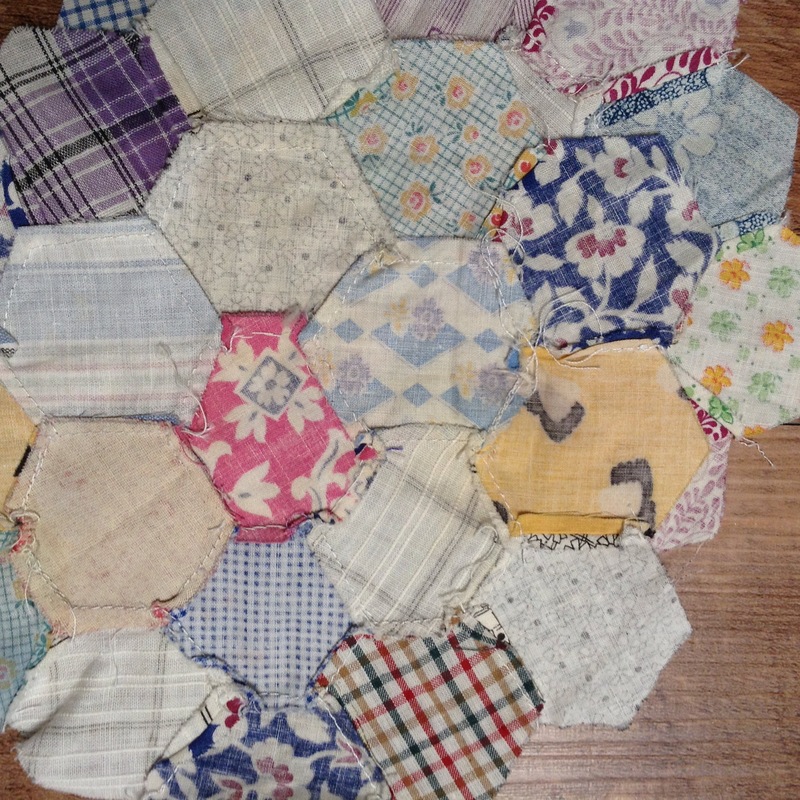 I have the following vintage quilt kits for sale. Please contact me via e-mail at sew4given AT aol DOT com if interested. I will take Paypal, money order, or personal check (must clear before shipping), in payment. Shipping via Priority Mail will be added to prices. 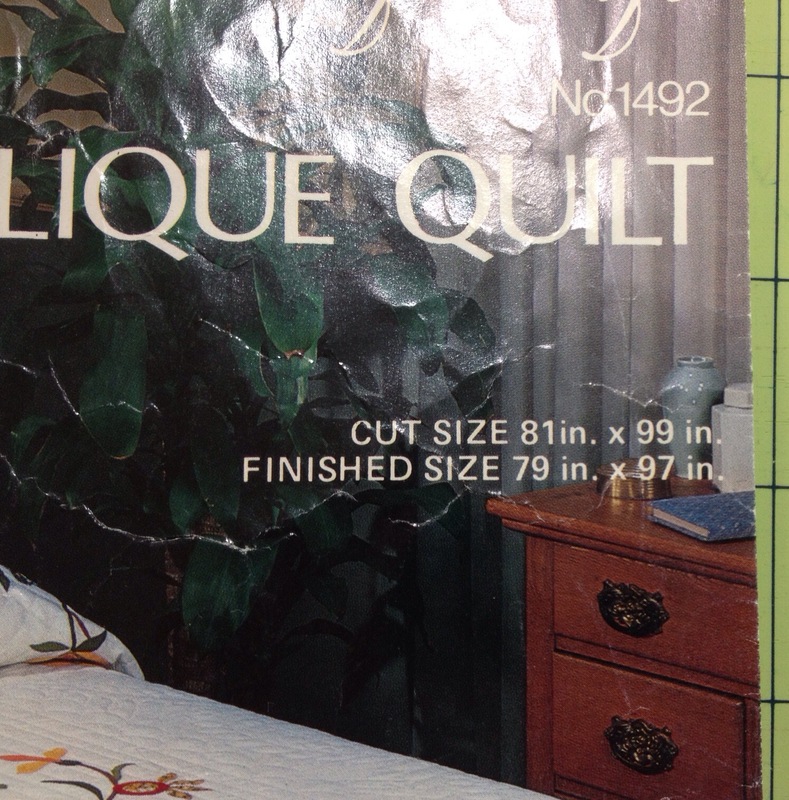 Quilt kits will fit in Medium flat rate box for $13.65. These sales are for US Buyers only. Sorry international people! 1. Stamped Cross Stitch Quilt top. Paragon Needlecraft, American Sampler, No. 01171. The embroidery in the center is nearly complete and very nicely done. This is the top only, you will need to purchase embroidery floss to complete. Finished size will be approx. 82″ x 100″. SOLD! 2. Sunflowers cross stitch quilt kit. Everything included. Excellent condition, I don’t think this had ever been unfolded until I did to take pictures. Sold! 3. Tree of Life Applique kit. Finishes at 79″ by 97″. Very clean except for mark on a fold line. Tobin No. 1492. SOLD! 4. Romantic Ribbons quilt kit. 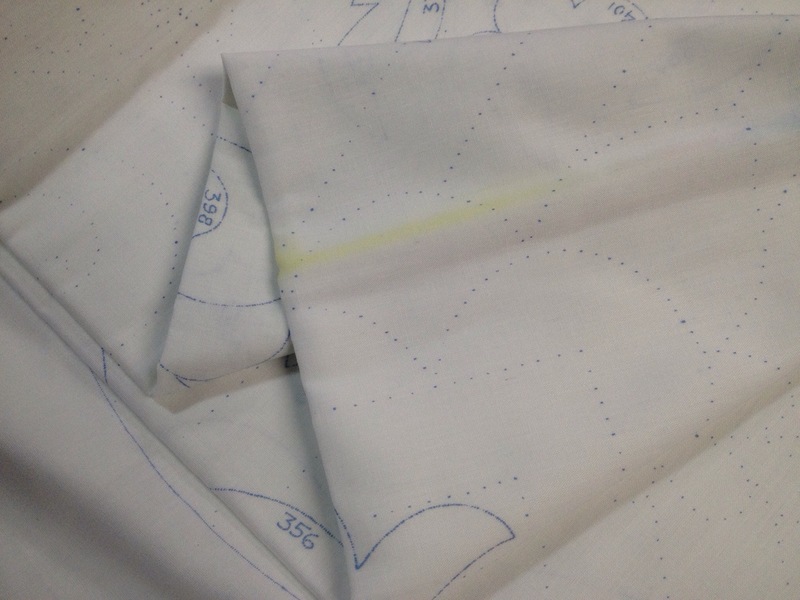 The insert says quilt or pillow sham, this is for the quilt kit. Finishes at 80″ x 96″. I just love the fabrics for the appliques. This is a lovely kit. Sadly, it appears that it had gotten damp at some point and there are water stains on the sheeting. The appliques all look fine. I have tried to show the pictures of the worst bits. It is possible that this can be cleaned. If not, you could use the background as a pattern and use the applique parts on new fabric. SOLD! 5. Vintage 1930’s Grandmother’s Flower Garden Blocks. Sold! 6. 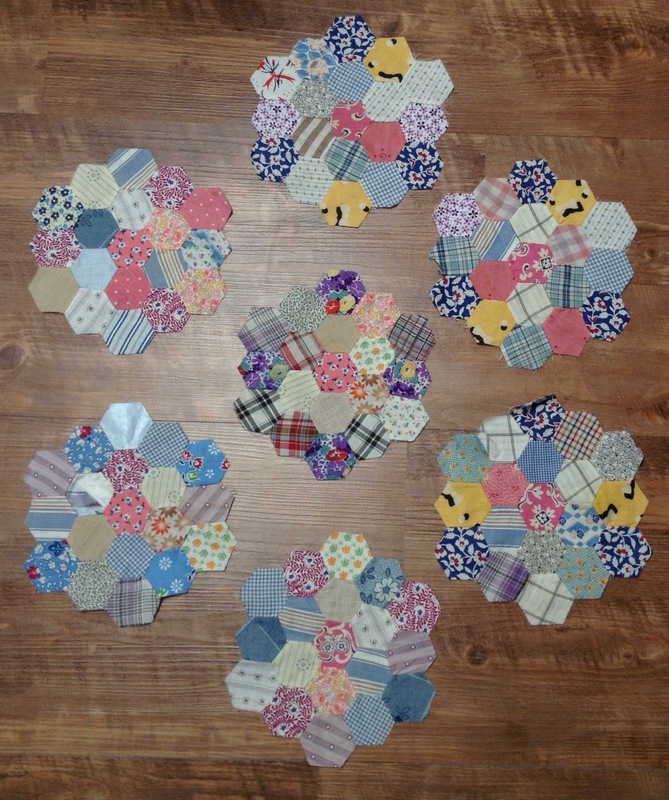 Vintage Hexie blocks. I’m not calling these GFG because they don’t look like flowers! These measure approx. 7″ x 8″. 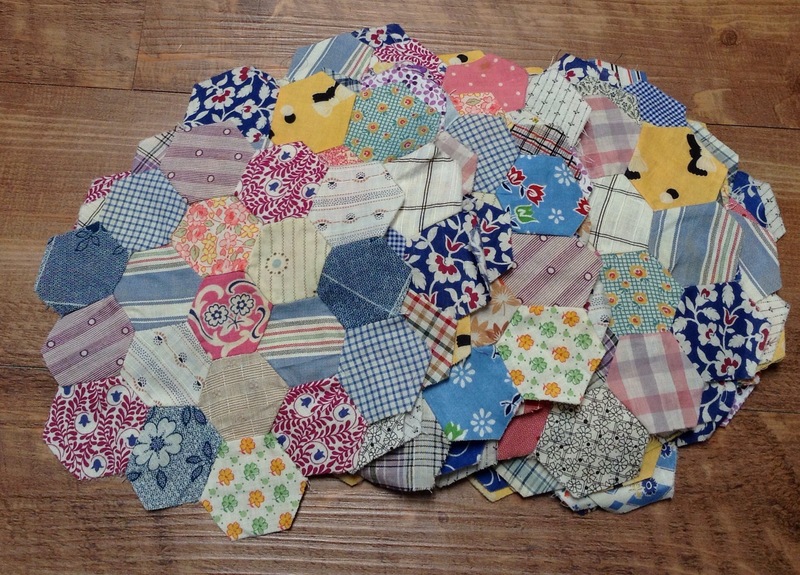 There are 27 blocks here, all handpieced. 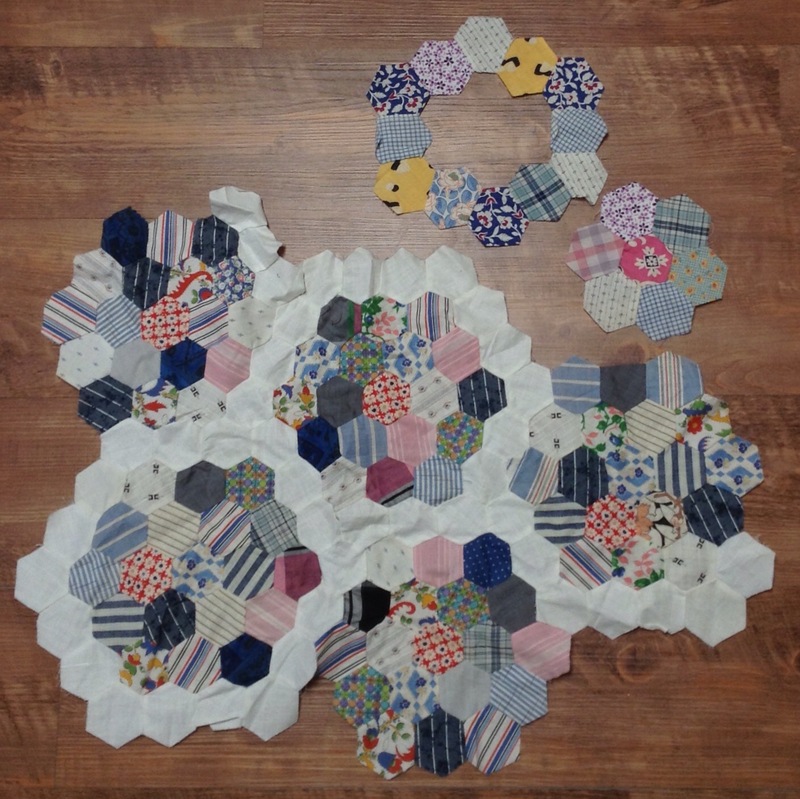 I am including some extra blocks that have been pieced together with a white fabric and some extra block parts (these are in addition to the 27 whole blocks). Interesting mix of 20’s -40’s fabrics. $25 plus shipping. I would like the Baby E memory quilt pattern, is it available? I love your sunflower quilt. And would love to buy it this month. Do you have paypal in order to pay? I’ll have to wait till the end of the month untill our disability comes in. Do you think that’s an option? 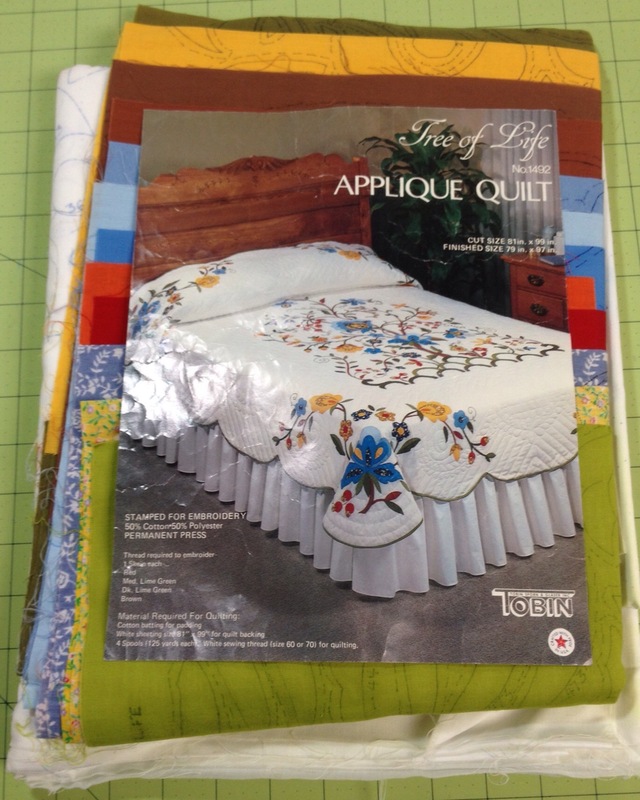 I am interested in the American sampler quilt top if it is still available please.